Kidney cancer is responsible for more than 338,000 new cases diagnosed annually worldwide and for over 13,000 fatalities every year in the United States alone, as stated by the American Cancer Society. Renal cell carcinoma (RCC) comprises nearly 85 percent of all kidney malignancies. Despite the development of targeted therapies, many patients develop resistance and eventually die of the disease. Innovative therapeutic approaches are required to improve the outcomes of RCC patients. Preclinical studies of renal xenograft animal models aid scientists in finding new therapies for RCC patients. The Renca tumorigenic epithelial cell line is derived from a kidney adenocarcinoma of Balb/cCr mice. Renca cells spontaneously metastasize to lung and liver, mimicking human renal cell carcinoma. A 2016 study in Cancer Science investigates the therapeutic efficacy of the combination of the mTOR inhibitor everolimus (EVE) and anti‐PD‐L1. The study demonstrates that anti‐PD‐L1 treatment enhances the antitumor effect of EVE in a mouse model, which is beneficial for the treatment of RCC. In 1997 Kadhim et al. published a study using Renca cells in mouse xenografts to characterize the antitumor activity of BCH-4556, a nucleoside analogue; results demonstrated tumor shrinkage, tumor growth inhibition and tumor cell cytotoxicity. BCH-4556 was later renamed as trxacitabine and progressed to phase II clinical trials. In 2011 Lavranos et al. presented data using a Renca orthotopic xenograft model to demonstrate the antitumor effects of BNC105, a vascular disruption agent; data demonstrated the drug affects tumor, but not normal vasculature formation. As of 2017 BNC105 progressed to a clinical combination therapy trial with Keytruda, a PD-1 inhibitor also known as Pembrolizumab. For a final example of a research study using the Renca xenograft model, Hirayama et al. (2016) demonstrated that immunotherapy against programmed cell death-1 (PD-1) and its ligand PD-L1 can be combined with the mTOR inhibitor treatment everolumus (EVE) and result in significantly decreaed tumor burden, increased tumor infiltrating lymphocytes (TILs) and higher ratio of cytotoxic CD8+ T-cells to TILs, supporting this combination therapy as a potential clinical treatment for renal cell carcinoma. The Renca cell line (mouse kidney) is used to create the CDX (Cell Line Derived Xenograft) Renca xenograft mouse model. 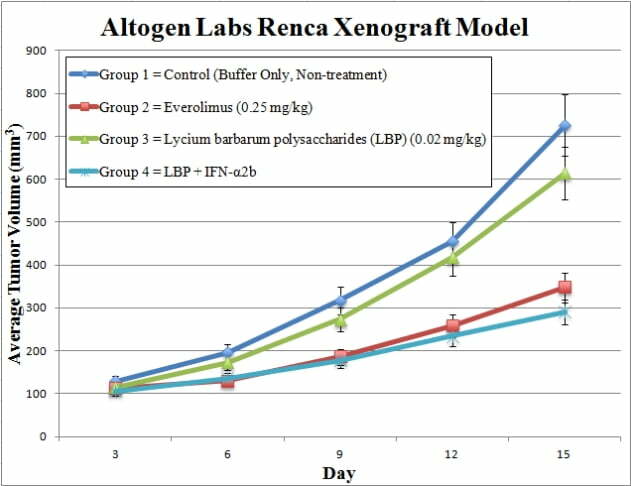 The Renca xenograft model is a kidney cancer model utilized in studying inhibition of angiogenesis (e.g. BAI1), JAK kinase inhibitors (e.g. AZD1480) and anti-tumor efficacy (e.g. imidazoquinoline). Renca cells are trypsinized and then cell viability is determined (trypan blue assay; 98% cell viability minimum). After adjusting the concentration of the cell suspension to 10,000 cells per µL (Matrigel + Renca cells), 10 week old athymic BALB/C or NOD/SCID mice are injected. All tumors are grown in the rear, hind leg flank via subcutaneous injections. Injection sites are checked (3x per week) until tumors are established. Continual tumor measurement (with digital calipers) is followed until average sizes of 50-150 mm3is determined. At this point, tumor size randomization into treatment cohorts and in-life administration of compounds are performed. All tumors are measured daily and mouse body weights are recorded. Mice are euthanized as the size limits are reached. All tissue collections are performed at the final necropsy, including tissues being snap frozen, prepared for histology or stabilized (RNAlater). Dissected tumors are documented (digital imaging) and weights recorded.